Ever hear of Balto? You may know of the 1995 animated movie with the actor Kevin Bacon starring as the voice of Balto. But you may not know Balto was a famous Siberian Husky sled dog that led a team carrying diphtheria serum from Anchorage to Nome, Alaska, in 1925 to combat an outbreak of the disease. The famous run is commemorated by the annual Iditarod dog race. Togo was another famous Siberian Husky involved in the well-known run to bring diphtheria serum to Nome. He led a team that travelled more than 90 miles of the treacherous route before Balto and his team finished the “race” to save lives. The Husky dog names list is full of dog names that really evoke emotions tied to the Siberian Husky dog breed. Some are Native American dog names, some are tied to Eskimo heritage, some are tied to northern climates and some I just like. It really was an interesting an ejoyable list to create. 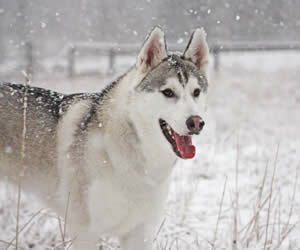 NOTE: If you like the beautiful Siberian Husky photo, you can thank echiax who made it available. Something to keep in mind when naming your Siberian Husky puppy is to match your dog’s personality and purpose with their name. Maybe you want to choose from a list of famous dog names or one syllable dog names. Or maybe you want to name your pup for a very personal reason, such as to remember someone special. To learn more about this dog breed, visit our Siberian Husky dog breed information page or read this book if you’re a Husky dummy. It’s always a good idea to learn about temperament, trainability, and even a little of the breed’s history before settling on a new dog. It’s also fun. Below is a list of my favorite 101 Husky dog names. Browse or study the list and have fun. If you don’t find a name you like, return to our Dog Names by Breed page to see more categories, or expand your search to our list of more than 4,000 puppy names. Famous Name: Akira is a Japanese manga series by Katsuhiro Otomo. It inspired the hit science fiction action film The Matrix (1999). Alice Truth and Noble or nobility. Alpha First one. First letter of the Greek alphabet. Famous Name: Anouk Teeuwe is a Dutch producer, singer and songwriter, known professionally as Anouk. Born 8 April 1975, she is the daughter of a blues singer and considered the Netherlands most famous female rock singer. Aurora Strength and vixen charm – Dawn. Balto Famous dog name associated with the Balto movie and and story from the 1920s. Blazer Like a trail blazer. Blue A color between green and indigo. Gloomy or depressed. Cherokee People of a different speech. Popular Native American dog name. Cheyenne Native American tribe living in the North West of the USA. Chinook A moist, warm wind experienced on the Pacific Northwest coast of the USA. Demon One of the Husky dog names from the movie Snow Dogs, played by a Siberian Husky named D.J. Eskobar Spoiled. believes that they always get what they want. Glacier A huge mass of ice moving slowly. Grizzly A species of brown bear. Hunter A hunter. One who searches for something. Hurricane A severe tropical cyclone. Igloo Dome shaped Eskimo house made of blocks of snow. Jonathan A Siberian Husky that serves as the University of Connecticut’s mascot, named after the state’s first Governor. Juno Also “Juneau,” the capital of Alaksa. Keesha This is one of my favorite female Husky dog names. Ladoga Unknown origin or meaning. Awesome-sounding name for a dog, though. Laika This is also one of my favorite Husky dog names. Laika was a mixed-breed Siberian Husky known as the first dog in space, getting there aboard Sputnik 2. Maverick One that dissents from the group. Max One of the Husky dog names from the movie Eight Below, played by a Siberian Husky named D.J. Famous Name: Maya Rudolph (born 27 July, 1972) is an American actress in TV and film, as well as a comedienne best known for her work on Saturday Night Live in the early 2000s. Movie credits include Grown Ups (2010) and Bridesmaids (2011). Famous Name: Mika is a British singer and songwriter. He was born August 18, 1983, as Michael Holbrook Penniman, Jr., but “re-branded” as MIKA to serve his musical career. He is known for the hit songs Grace Kelly and Love Today, and for selling more than 5 million copies of his first full length album, Life in Cartoon Motion. Famous Name: Natalie Portman is an Israeli-American actress. Her past films include the Star Wars prequel trilogy (1999, 2002, and 2005), V for Vendetta (2008), Black Swan (2010), and No Strings Attached (2011). She also appeared as Jane Foster in Thor (2011) and returns in Thor: The Dark World in 2013. Nomad One who roams, a wanderer. North Star Star is also a good name. Nova A star that suddenly becomes much brighter. Rudy From Rudolph – Famous wolf. Scooter One who goes suddenly and speedily. Sierra A rugged range of mountains. Silver A lustrous white metallic element used in jewelry, tableware and coins. Spirit Part of the human being associated with the mind. Vigorous or animated state – spirited. Also distilled alcohol. Tahoe Denali also comes to mind. Tank A large metal container. A heavily armed combat vehicle. A friend of mine used this name for his black Labrador Retriever. Teeko This is actually a strategy game invented in the late 1930s, but I like it as a name, too. Timber Wood used as a building material. Also timber-wolf. Togo Famous Alaskan sled dog. Tundra Very popular among Husky dog names. This is the name of my good friend’s American Eskimo puppy. Walter Mighty warrior. I (still) have a stuffed bear named Walter and I love this name. Famous Name: Walter Leland Cronkite, Jr. (born 4 November 1916; died 17 July 2009) was one of America’s most famous radio and TV journalists. He anchored the CBS Evening News for almost two decades from 1962 to 1981 and was one of America’s most trusted news men. Whisper Something spoken very softly. Willow A deciduous tree with narrow leaves. Zodiac In astronomy the path that represents the planets, moon and sun. Zorro Means fox in Spanish. Also, Don Diego de la Vega’s secret name in the Zorro stories. Can’t find the name you like on the Husky dog names list? Don’t give up. Return to our Dog Names by Breed page to do some more exploring. If you have a great name, tell us about it! Myah is My Dog’s Name Not rated yet My dog Myah is just a beautiful dog and the name fits her just right.